"It's great," Witherspoon told Noisecreep. "It closes the part that was missing as far as when it comes to vocals, the singing. If there's a comparison, I told him, 'You're like my Richie Sambora to Jon Bon Jovi.' I'm Black Jovi. [Laughs] You know what I mean? It's silly but that's what it's like. That team really works. I feel like with him back it's just the band the way that it's supposed to be. "We always knew he'd come back anyway. I think everyone has to follow their destiny and follow their dreams. Ultimately, I knew Clint was going to come back to the band." 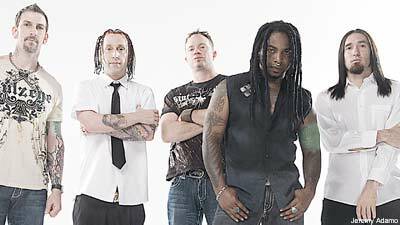 'Cold Day Memory' is Sevendust's eighth studio album and is due in store April 20 on their own 7Bros. Records through Warner Music Group's Independent Label Group. Sevendust recorded 'Cold Day Memory' with Grammy-nominated producer Johnny K. Witherspoon and titled the album after the experiences he had in Johnny K's Chicago studio. "Well, 'Cold Day Memory' is actually the name of a song that didn't make the album," he said. "Plus, there's the experience of being in Chicago and it being snowy and freezing cold the whole time we were there, with the exception of two days. I think the name was fitting to the experience that we went through while recording the album 'Cold Day Memory.' It'll always be that type of memory for me. I didn't ever leave the studio while doing this album." Working with Johnny K, whose credits include Disturbed, Staind, 3 Doors Down and Plain White T's, was a positive experience, he explained. Using a different producer, he added, shows the growth within the band. "He's really cool," Witherspoon said. "It was great. It was very relaxed, never a stressful point during the whole album. Johnny was a really nice person. I liked him not only as a producer but as a friend. Even though it was in remodeling conditions, there was a great energy we were able to create. I called the vocal area--and Johnny said he's going to keep it--"The Zone." When you're in "The Zone," it's time to work. That was created there. We have some good memories there." Among those memories is working with tunesmith Dave Bassett (Shinedown, Adelitas Way) during the songwriting process. "For the songwriting process, like we always do, get together and write and different ideas come out," Witherspoon said. "We had one guy come in and help. Dave Bassett wrote two songs. That was good. That was the first time we've ever done anything like that. Besides working with a couple of our close friends on albums from Aaron Lewis to Myles [Kennedy] and Mark Tremonti and doing things with Chris Daughtry, that was the first time we brought a different person in to write. It was interesting and cool."